The author is a Visiting Research Fellow at the University of Manchester, UK and the leading world expert on fossil spiders preserved in amber and in interpreting what they can reveal about the ecology of the extinct forests in which they lived. In this beautifully illustrated book David Penney uses a unique, integrated approach, which combines and compares information derived from both fossil and living spiders. 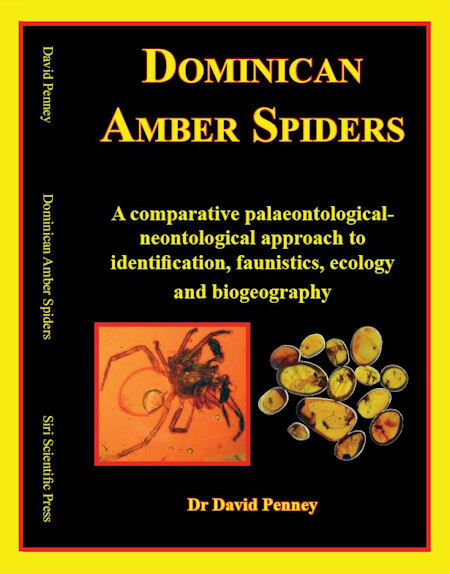 He provides a comprehensive synthesis of what is known about the Dominican Republic amber spider fauna, much of which is based on his numerous scientific publications in leading international journals. The index goes on for another 2 pages.However, the book is not intended solely for academics. 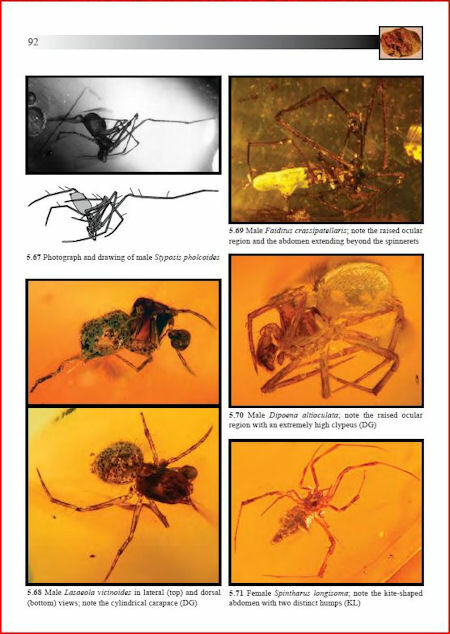 It contains more than 330 illustrations including many colour photographs, which will permit the identification of both the fossil and living Hispaniolan spider faunas by both amber collectors and spider enthusiasts. 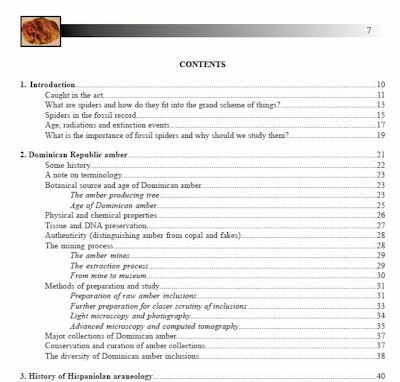 Additional chapters provide full coverage of what is known about the age, geological origins, chemistry and botanical source of Dominican amber and the mining, preparation and distribution processes, which the author has witnessed first hand. Previously unpublished research on historical biogeography should make this book of value to all those interested in the origins of Caribbean biodiversity. The volume also contains an extensive bibliography of more than 350 entries, providing a valuable resource for anybody interested in amber. This book far surpasses anything else available on this subject and is expected to remain the leading reference work for many years to come. It is a must for anybody interested in spiders or Dominican amber! First published in May 2008, this is a superb book on Dominican spiders. Rather difficult to get a hold of and rather expensive, it is worth it if you have any interest in spiders at all. This has glossy pages, high quality paper and is just plain good.